It all started in Hamburg, on the first Saturday of my 4-week trip. 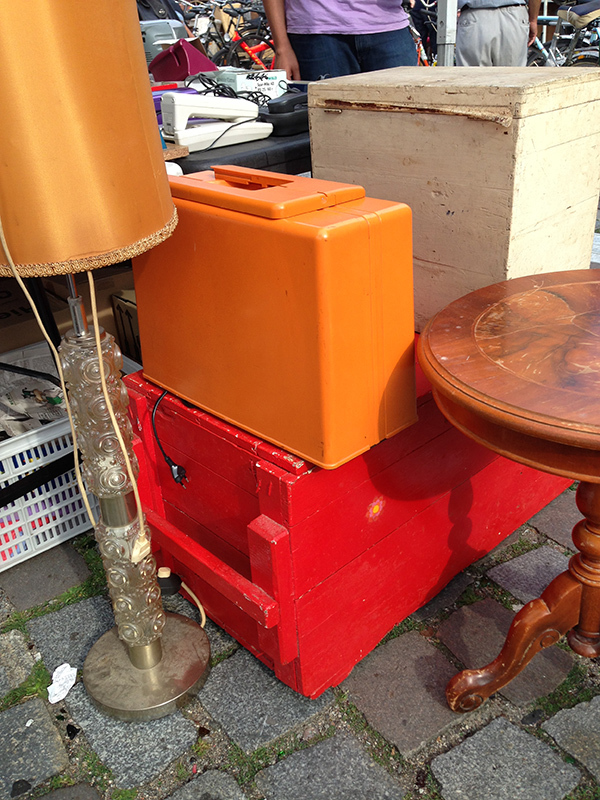 I had heard wonderful things about the Hamburg flea markets, so I knew that was a required Germany adventure – it doesn’t get more “Sam” than flea markets. I woke up bright and early, ate my requisite daily croissant-like breakfast item, and hopped on the UBahn toward Sternschanze, my destination for the “Flohschanze” flea market. I emerged from the subway station into a bustling crowd in the morning sunlight. People and stuff and more people and more stuff! I crossed the street to enter the market area, and glanced at the first booth. The first booth. 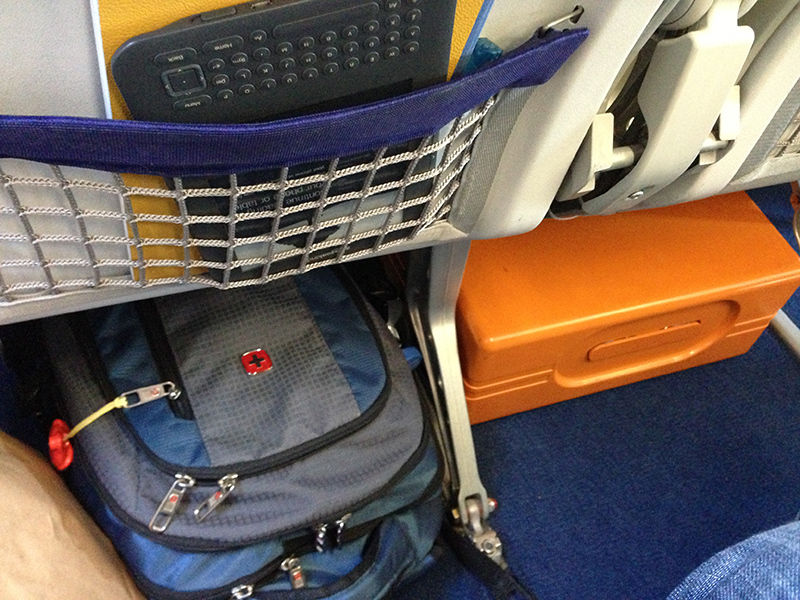 And I saw something in a bright orange hard plastic case. So I opened the case. 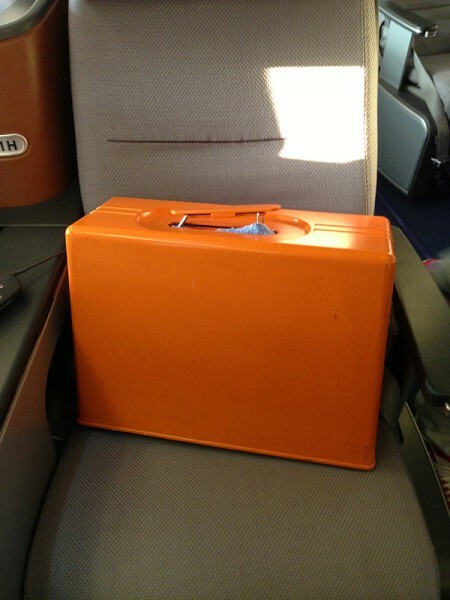 And, as my hopeless little heart had suggested, the inhabitant of the case was orange. The most perfect orange. With clean, shiny features and olive green contrast. The needle moved up and down. The pedal and plug appeared intact. She was perfect and orange and gorgeous. 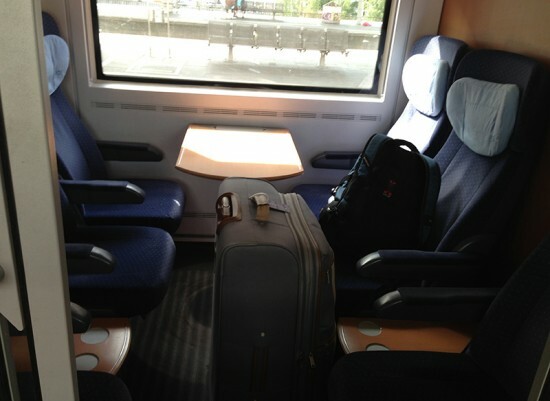 But I was in Germany, and I still had a lot of traveling to do before I reached home again. 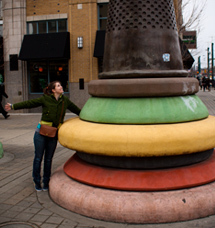 I picked her up, tentatively, testing her weight. I just picked her up for a second, so I thought to myself, “hmm, not that heavy.” I asked the man for a price – 25 Euros – then talked myself out of it and continued through the flea market. In fact, the reason I took the photo above is because I decided not to buy the sewing machine, I’d just take a picture instead. 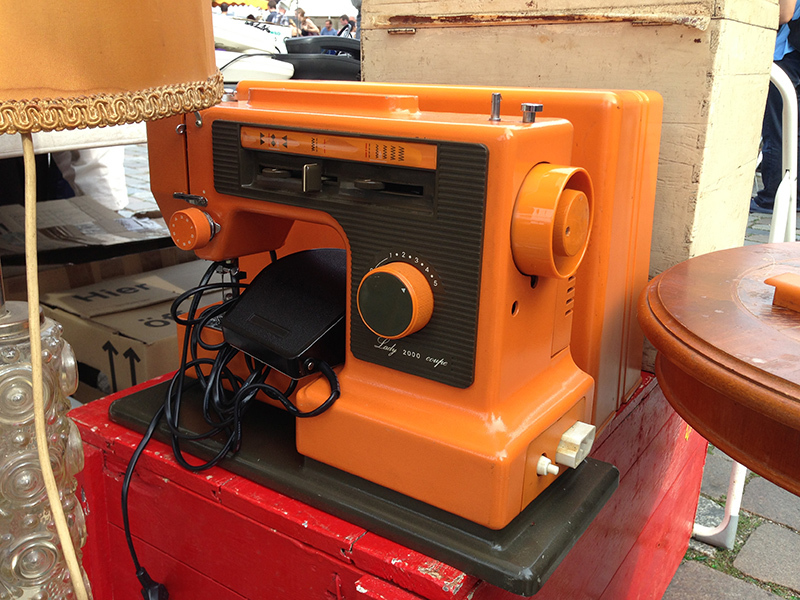 Since it was the first booth I had seen, I wasn’t even sure if that sewing machine was special. Maybe all sewing machines in Germany were orange! Maybe everything was orange. Maybe I could find a flea market souvenir that would be easier to pack and would make my heart flutter even more. I kept the sewing machine in the back (or front) of my mind as I explored. I’d have to take it on the UBahn home, then on the train to Berlin, then on the UBahn to the airport, then on the plane home. It was foolish, I told myself. I have a lot of sewing machines. I didn’t need another one. I was completely set in my plan as I left the market. I passed the same booth on my way out, of course – this time it was the last booth as I approached the UBahn. 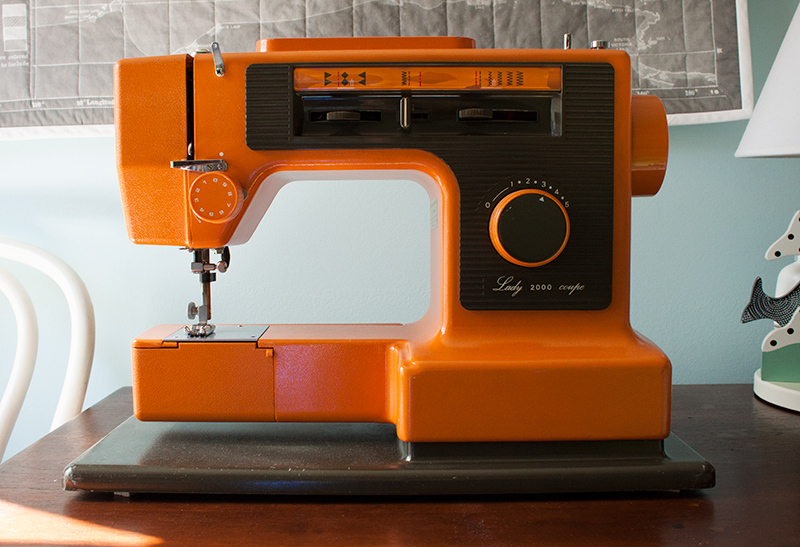 I glanced back to say goodbye to the orange sewing machine I had seen… and I didn’t see it. My heart dropped a thousand feet. 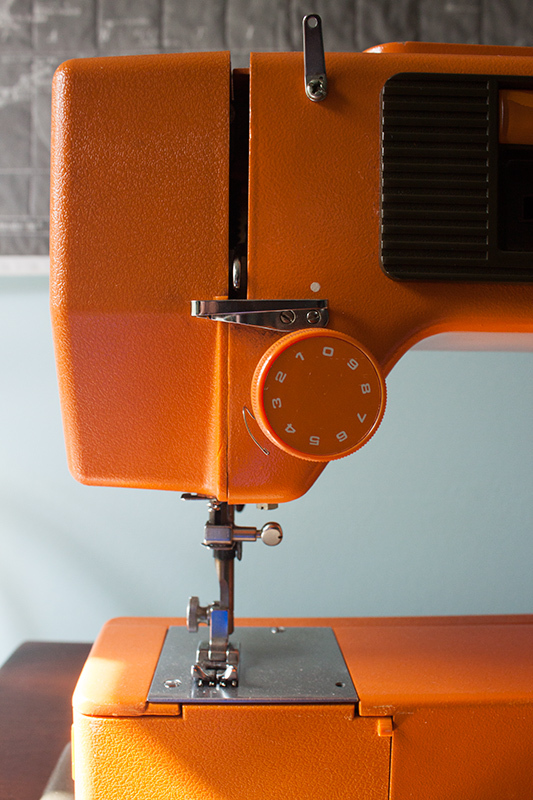 Had someone bought my sewing machine before I had the chance to say goodbye? I felt an unbelievable (and quite frankly, ridiculous) sadness – nearly despair – and looked around the corner of the booth. There she was! Of course. She hadn’t even moved… after my wandering past so many tables I had forgotten that the sewing machine was hiding behind the box you see in the photo above. There had been no cause for alarm. But of course, that alarm, that sinking feeling in my heart, was not something I could bear to experience again. I used my growing German skills to haggle with the seller, and gave him 20 Euros in exchange for my hübsche orange Nähmaschine. 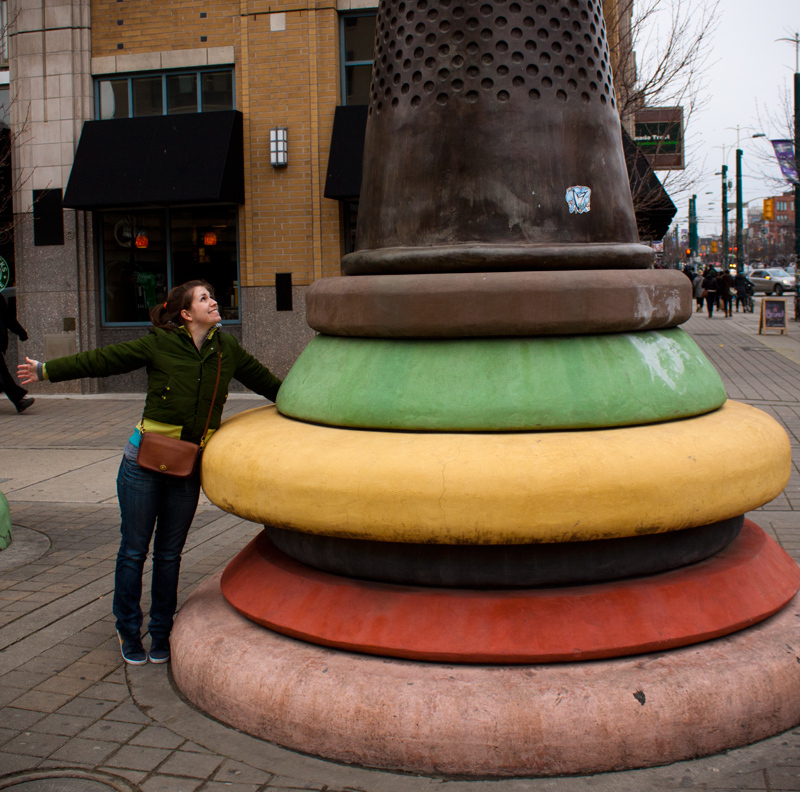 I picked it up… and groaned at its weight. My initial weight test had clearly been conducted with a swooning heart. I had a good story to tell in German class the following Monday, and my classmates had a good laugh and shared my concerns. The woman I was staying with in Hamburg said it was certainly a little bit crazy, but she may have also swooned at the sight of such a bright, pretty thing. I plugged it in, and all was well! Lights on, motor hums, zigzags even zig and zag! It only came with a bobbin, no top thread, so I’m not certain of its tensioning abilities, but it makes a solid, strong humming sound and is mechanically smooth. Next, it was time to travel. I had a compartment to myself on the train ride from Hamburg to Berlin, so I had a good chance to recuperate after lugging my enormous suitcase and the sewing machine on the bus to the train station. I felt like I was in Harry Potter! To get from the train station to my Berlin lodgings, however, I had to transfer twice – first from the train to the S-Bahn, and then from the S-Bahn to the UBahn, which required approximately 4 flights of stairs. I was comically miserable by the time I arrived at my room in Berlin, but my new roommate laughed at my sewing machine and called me crazy. We became friends, and I taught her how a sewing machine works! When it was finally time to head home from my wonderful voyage, I dreaded the sewing machine lugging reprise. Rather than deal with my luggage on the rapid transit again, I called a shuttle and it was a glorious relief. 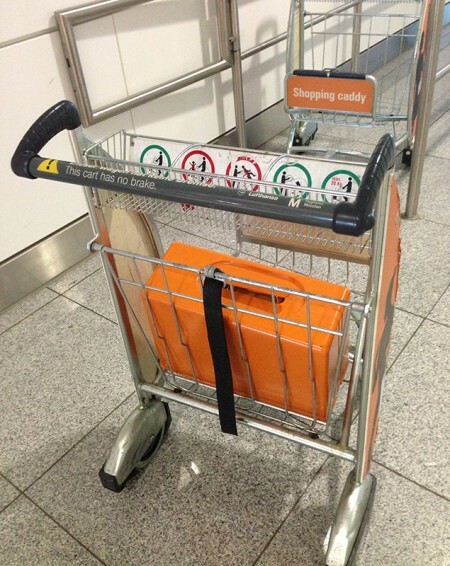 That, and the free airport carts. My orange sewing machine and I flew together from Berlin to Munich. I had wrapped her in a towel so she wouldn’t bang against the inside of the plastic case if I had to lay her sideways. She fit perfectly under the seat. At Munich airport, she got to ride around in the cart again and we were both very happy. 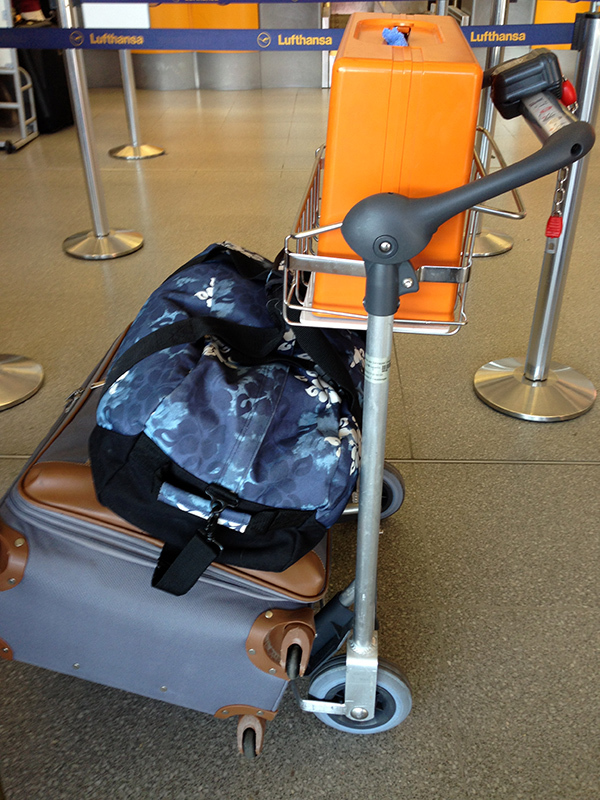 Finally, I flew from Munich airport home. Despite what this picture suggests, I did not give up my seat for my sewing machine :) A nice man helped me lift her into the overhead bin. As I write this and relive this story, I know it was completely crazy. Every time I look at the sewing machine I remember how completely crazy it was to bring home a 16 pound – yep, I weighed it – carry-on souvenir home from Europe. But that crazy feels good. It feels like something I would do. And that makes me very happy. And really, look at her. Can you blame me? Way to go – it (she) is awesome!!!! This is so precious! And I love the colour orange, so cheery and sunny! Do the plugs in Germany match the plugs here in the U.S.? Haha! Nope F.K., that was my other argument against buying one – Germany uses the European plug with two round prongs, and I need a voltage converter as well. I haven’t found one that I’ll trust enough yet! Best of luck, it’s a really gorgeous machine! When I went through security one of the guys wanted to take the cover off the case but then a woman working there was like “it’s fine, just send it through”. So nope, I had no problems at all. I had already removed the needle and put that in my checked bag. 26 pounds is sure heavy! Is it a household Juki or industrial? No. I can’t blame you. It’s amazing! That’s amazing, and it’s gorgeous! Great find!